Noise induced hearing loss is a permanent hearing impairment resulting from prolonged exposure to high levels of noise. One in 10 Americans has a hearing loss that affects his or her ability to understand normal speech. Excessive noise exposure is the most common cause of hearing loss. Because of occupational risk of noise induced hearing loss, there are government standards regulating allowable noise exposure. People working before the mid 1960s may have been exposed to higher levels of noise where there were no laws mandating use of devices to protect hearing. 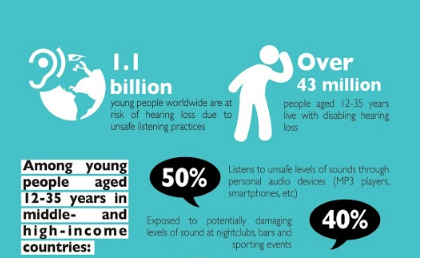 Recent studies show an alarming increase in hearing loss in youngsters. Evidence suggests that loud rock music along with increased use of portable radios with earphones may be responsible for this phenomenon. When noise is too loud, it begins to kill cells in the inner ear. As the exposure time to loud noise increases, more and more hair cells are destroyed. As the number of hair cells decreases, so does your hearing. Currently, there is no way to restore life to dead hair cells; the damage is permanent. The damage caused by noise, called sensorineural hearing loss, can be caused by several factors other than noise, but noise-induced hearing loss is different in one important way – it can be reduced or prevented altogether. First, we have to define noise. Sound can be measured scientifically in two ways — intensity and pitch. Both of these affect the degree to which sound (noise) damages hearing. Intensity of sound is measured in decibels (dB). The scale runs from the faintest sound the human ear can detect, which is labeled 0 dB, to over 180 dB, the noise at a rocket pad during launch. Decibels are measured logarithmically, being 20 times the log of the ratio of a particular sound pressure to a reference sound pressure. This means that as decibel intensity increases by units of 20, each increase is 10 times the lower figure. Thus, 20 decibels is 10 times the intensity of 0 decibels, and 40 decibels is 100 times as intense as 20 decibels. Sound intensity may be given in two different units. Persons interested in the actual physical quantification of sound use units of sound pressure level (SPL). SPL is calibrated to a constant sound pressure level that does not vary with frequency. On audiograms, however, sound intensity is calibrated in hearing level (HL), meaning that the reference sound is one that that just barely heard by a normal population. Thus HL units are relative ones and do not generally correspond to SPL units. Higher intensity (db) of sound causes more damage. Many experts agree that continual exposure to more than 85 decibels may become dangerous. The following table illustrates some common sounds and their intensity. Pitch is measured in frequency of sound vibrations per second, called Hertz (Hz). Frequency is measured in cycles per second, or Hertz (Hz). The higher the pitch of the sound, the higher the frequency. A low pitch such as a deep voice or a tuba makes fewer vibrations per second than a high voice or violin. Generally noise induce hearing loss occurs at a pitch of about 2000-4000 Hz. Frequency is measured in cycles per second, or Hertz (Hz). The higher the pitch of the sound, the higher the frequency. Young children, who generally have the best hearing, can often distinguish sounds from about 20 Hz, such as the lowest note on a large pipe organ, to 20,000 Hz, such as the high shrill of a dog whistle that many people are unable to hear. Human speech, which ranges from 300 to 4,000 Hz, sounds louder to most people than noises at very high or very low frequencies. When hearing impairment begins, the high frequencies are often lost first, which is why people with hearing loss often have difficulty hearing the high-pitched voices of women and children. Loss of high frequency hearing also can distort sound, so that speech is difficult to understand even though it can be heard. Hearing impaired people often have difficulty detecting differences between certain words that sound alike, especially words that contain S, F, SH, CH, H, or soft C, sounds, because the sound of these consonant is in a much higher frequency range than vowels and other consonants. 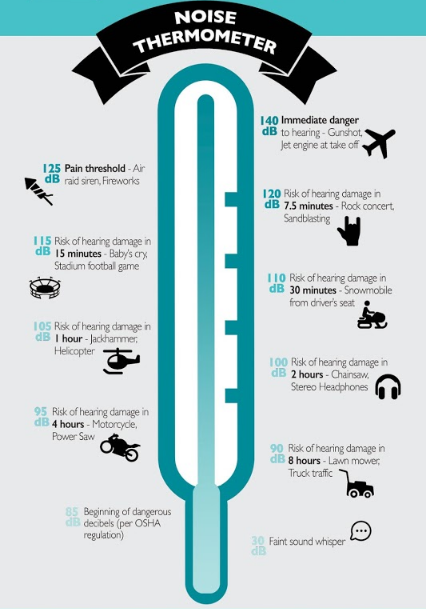 In addition, the duration (how long you are exposed to a noise) can affect the extent of noise induced hearing loss. The longer you are exposed to a loud noise, the more damaging it may be. Every gunshot produces a noise that could damage the ears of anyone in close hearing range. Large bore guns and artillery are the worst because they are the loudest. But even cap guns and firecrackers can damage your hearing if the explosion is close to your ear. Anyone who uses firearms without some form of ear protection risks hearing loss. Excessive noise is present in many situations. Some of the more common ones include occupational noise (machinery, etc. ), loud music, and non-occupational noise (lawn mowers, snow blowers, etc. ).